In an ideal company, every employee understands the finances and knows how to make effective decisions based on them. However, in reality, the majority of employees have little to no understanding of the financial workings in their organization. The Business Literacy Institute offers a range of training options to help bridge the financial knowledge gap in your company, no matter how narrow or wide the gap may be. 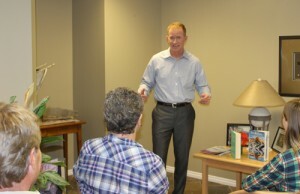 Instead of the typical “one size fits all” approach, BLI has always used a customized approach by partnering with you, our client, and integrating adult learning techniques to effectively educate each participant. We have formulated several delivery options – some customizable, some as complimenting tools – all described below. Keep in mind, that all these options work really well together, and when used as an integrated approach, can create an even stronger foundation of financial literacy. Another differentiator is our team of facilitators. They are not “boring talking head accountants” or academic professors, but rather real-world finance experts whose enthusiasm for finance is infectious. Along with the variety of learning techniques they use to engage and educate the audience, a key element of their success is how they communicate their own enthusiasm and love of finance using terms and stories everyone can understand. We’ve had more than one client ask us to add another day to an existing class because the attendees wanted more. Attendees asking for more finance training… now that’s different! What exactly makes our classes different from the rest? We start by working with your organization to customize content for your intended audience – whether it’s for executives, managers, salespeople, HR, IT, engineers, or all your employees. BLI believes live training provides the best platform for learning difficult subjects. Giving participants the opportunity to ask questions and get direct feedback improves their learning. Your employees will become fluent with the foundational elements of finance, such as the income statement, balance sheet, and statement of cash flows. Topics also include the matching principle, cash versus profit, revenue recognition, important ratios, accruals, goodwill, free cash flow, and more. We will reinforce how these topics apply to your organization by having them use your financial results and key performance measures to demonstrate the principles. Everyone stays engaged through the use of real-world stories and exercises. They will return to work understanding what is important to the organization and how to make an impact on its financial health. While live training is optimal, in some cases, online training provides a cost effective way to reach more employees and give them the opportunity to learn at their own pace. Our online training covers the same topics as a live courses, allowing employees to watch the video clips and answer quiz questions as their schedules allow. It’s business finance training on demand. In addition to training on the income statement, balance sheet, and statement of cash flows, our online financial training covers the “Big 5” numbers Wall Street and investors have on their radar. Apple, Inc.’s financials are used to calculate ratios and understand the story the financial statements are trying to tell. 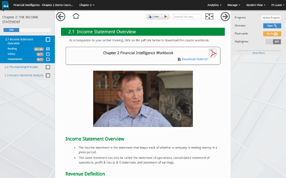 You will find three hours worth of video segments teaching these financial concepts, along with quizzes to test knowledge, and reference material that allows employees to further strengthen their training. Check out a sample chapter here. Many of our clients offer our books to their employees as pre or post-reading to build on the learning options we offer. 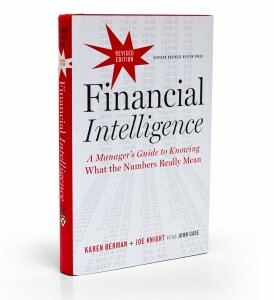 Our series of “Financial Intelligence: A Manager’s Guide to Knowing What the Numbers Really Mean” books, co-authored by Karen Berman and Joseph Knight, are a valuable go-to on many corporate and home-office bookshelves. 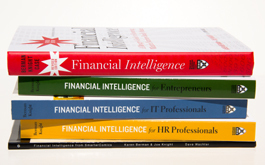 While our recently revised and expanded edition of “Financial Intelligence” has become an Amazon best seller. 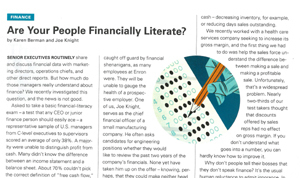 BLI also published a comic book version of Financial Intelligence characterizing Karen and Joe discussing the basics of finance. It’s perfect for those who want a fun and informative overview. If you’re looking for specific information on a topic Joe has also written the Return on Investment (ROI) Toolkit, Understanding EBITDA, and Business Valuation Toolkit for Harvard Business Press. Company management typically believes their employees know more about finance than they actually do. Through our experience working with many clients from different industries we have found most do not have a very good understanding of finance. We commissioned a national study to test managers of companies with at least 150 employees on their basic financial knowledge. The results were astounding – the average score across the United States was 38 percent! Read the whole article from the Harvard Business Review. We now offer this same test to everyone, as a standalone assessment or as a pre- or post-test to a training class. You’ll know your score immediately and see what the correct answers were to any you missed. This is a great tool to measure what training is needed, and how much participants learned after the fact. Finally a way to quantify that learning is necessary and effective! If your audience is spread out and can’t get together for a live training, consider hosting a financial intelligence webinar instead. Typically 90 minutes to 2 hours, we will customize the webinar to address the specific content needs of your audience. Attendees can ask questions throughout the session to ensure they still get the needed feedback to reinforce their learning. As an example, many of our clients find webinars to be a very efficient tool to train their traveling sales force. By dedicating a couple of hours to addressing both their own organization’s key measures and concepts, and that of their clients and industry, they become a more aligned and successful sales team. 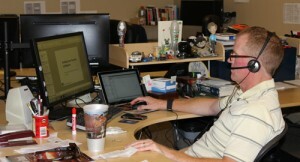 Need a great way to keep employees engaged with the numbers? Each quarter right after your earnings call, schedule a conference call with us to walk through the important items discussed during the call, and identify how employees can impact the direction of the company. We customize each call to your needs: we can focus on a single specific topic or take a general approach and discuss multiple topics. We can also build in dedicated time for general Q&A. Keynotes are a great way to teach and inspire a large audience at your next company gathering. You can choose one of our popular keynote addresses or have us customize one to convey the critical points you want your employees or professional association to understand. Through real-world examples your audience will learn financial concepts, ratios, and how to understand the financial statements. Along the way, the audience will have fun while they learn, and walk away with critical knowledge. Financial literacy is a powerful skill that can lead to both professional and personal success. Joe Knight, Owner and Senior Consultant with the Business Literacy Institute, is a highly regarded finance and business literacy keynote speaker, trainer, and published author. His keynote addresses are resounding successes with diverse audiences because of his unique ability to combine a lot of content with energy and humor. Visual learning makes a deeper connection for many participants. 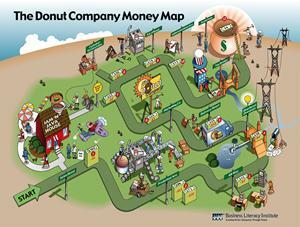 BLI has created customized money maps for countless clients over the years. They are an amazing and proven learning tool, plus they’re just plain fun. What better way can you actually SHOW how a financial or business process flows throughout your organization? Our professionally illustrated money maps do just that, all in one drawing, so that learners see how all the elements fit together, and affect each other. You’ll find your employees save these maps, hang them in their office, and use them to explain the concepts to others. Order one of our standard money maps today! "Great speaker; great stories to illustrate his points; I understand finance stories better than ever! I’m impressed because I hate math, & it’s not so scary anymore!" "Did a great job of putting financial terms in layman’s language." "Finance can be a dry subject; this was not! Excellent workshop!" 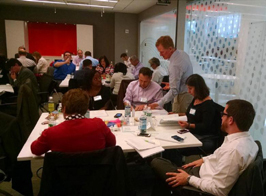 "BLI delivered; kept a complex topic interesting and applicable." "Fantastic presentation! Witty, knowledgeable & an outstanding teacher." Joe has been interviewed on a variety of radio, TV and web shows, including Bob Brinker’s Money Talk and CBS’ Morning Call. Watch the interview conducted by Harvard Business School Press.